My name is Taylor Mock. Since February I have been volunteering in the GEMM Lab and am ecstatic to make my online debut as part of the team! For many years, I had a shallow relationship with Hatfield Marine Science Center. As a Newport native, I would spend mornings and evenings glancing over at the Hatfield buildings while driving over the bridge to and from school. I was always intrigued. Sure, I would hear snippets of research from my peers about what projects their parents were involved in, but the inner workings of the complex mystified me. Toward the end of my Freshman year in 2012 at Westmont College in Santa Barbara, California, my mom asked me what my summer plans were. I replied with the typical “I don’t know… Get a job?” She insisted that instead of a job I think about getting an internship; experience that will last more than a summer. I inquired through a family friend (because every person in this little community is woven together some way or another) if any internships or volunteer opportunities were available at Hatfield. She pointed me in the direction of the Environmental Protection Agency and thus began my Hatfield volunteering saga. I worked that summer, and the next, at the EPA under the direction of Ted DeWitt and Jody Stecher on denitrification studies in estuarine marshes. That summer provided me a glorious front row seat to field research and a greater understanding of my potential as a person and as a scientist. Now, this experience was marvelous, but I knew shortly after starting that my heart was elsewhere. It was during my study abroad semester in Belize as part of my internship at the Toledo Institute for Development and Environment (TIDE) that I realized I wanted to work with marine macroorganisms. At TIDE, I engaged in radio telemetry conservation efforts tracking Hicatee (Dermatemys mawii) aquatic turtles. We would spend days on a small boat floating through canals and setting nets in hopes of capturing individuals of this small population to outfit them with radio tracking devices. These would be later used to track foraging, mating, and travel patterns in the region. It was an amazing time, to say the least. I remember waking up on my 21st birthday from my camping hammock and staring up at the lush rainforest above my head with a warm breeze across my face, followed by spending the day in the presence of these glorious creatures. It was heaven. I returned to Westmont the following term and took a Marine Mammal Eco-Physiology course and absolutely fell in love with Cetacea. Yes, I had always been captivated by this clade of beings (and truthfully when I was eight years old had a book on “How to Become a Marine Mammal Trainer”), but this was deeper. Of course, pinnipeds and otters and polar bears and manatees were enjoyable to learn about. There was something about the Cetacea though and how they migrated up and down the coast (just like me!) that I really connected with. My time learning about these animals created an intimate understanding of another group of species that developed into a rich, indescribable empathetic connection. I had to take a couple years away from scholastics and away from biology for health and wellness reasons. One day, though, a couple years after graduating and returning to Newport I rekindled with Jody from the EPA. He asked me if I would like to volunteer under Leigh Torres in the Marine Mammal Institute at HMSC. I do not think I could have possibly said no. I have been enjoying my time in the GEMM Lab ever since! Though I am available to help anyone with any task they need, the work I do mostly centers around photogrammetry. Using photogrammetry skills to measure gray whales in the GEMM Lab. Photogrammetry, essentially, means geo-spatially measuring objects using photographs. What that looks like for me is taking an aerial photograph (extracted from overhead drone video footage) of a whale, running the image through a computer program called “Matlab”, taking a series of measurements from the whale (e.g., tip of the mandible to the notch of the fluke, distance between each tip of the fluke, and several measurements across the midsection of the whale). Several images of individuals are processed in order to find an average set of measurements for each whale. You might be wondering, “How can one measure the distance accurately from just a photograph?” I am glad you asked! The drones are outfitted with a barometer to measure the atmospheric pressure and, in turn, altitude. The changing altitudes are recorded in a separate program that is run simultaneously with the video footage. Thus, we have the altitudinal measurements for every millisecond of the drone’s flight. To monitor the accuracy and functionality of the barometer, calibrations are completed upon deployment and retrieval of each drone flight. To calibrate: the initial takeoff height is measured, a board of known length is thrown into the water, the drone will then rise or lower slowly above the board between 10 and 40 m, photographs of the board are then taken from varying altitudes, and are processed in Matlab. 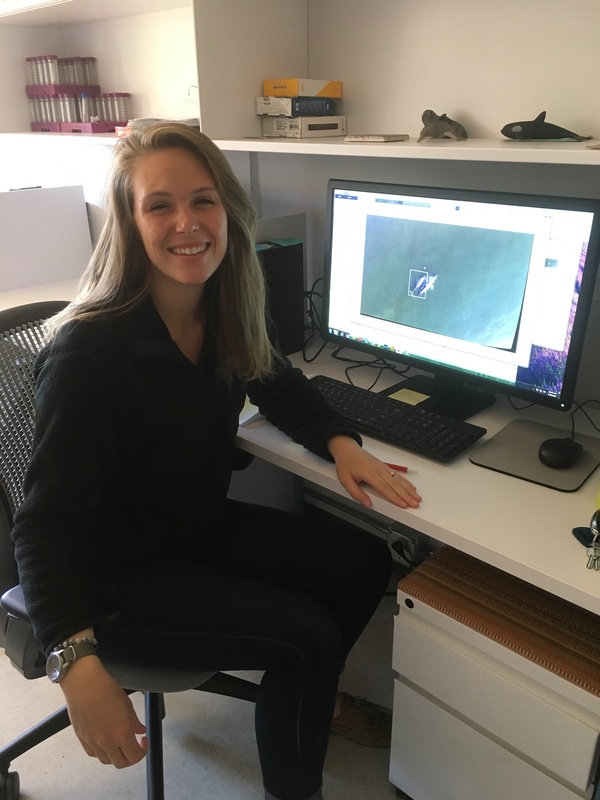 During my time in the GEMM Lab, I have had the pleasure of completing photogrammetry assignments for both Leila on the Oregon Coast gray whale and for Dawn on the New Zealand blue whale projects. These ladies, and the other members of the GEMM Lab, have been so patient and gracious in educating me on the workings of Matlab and the video processing systems. It is a distinct honor working with them and to delight in the astounding nature of these creatures together. Each day I am struck in sheer awe of how beautiful and powerful these whales truly are. Their graceful presence and movement through the water rivals even the most skillful dancer. Over the last 6 years, I am delighted to say that my relationship with Hatfield has become much deeper. The people and the experiences I have encountered during my time here, especially in the GEMM Lab, have been nothing short of incredible. I am sincerely grateful for this continued opportunity. It fills my soul with joy to engage in work that contributes to the well being of the ocean and its inhabitants. Thank you, Leigh and all of the GEMM Lab members. I hope to continue volunteering with you for as long as you will have me.